Classic Grilles bronze vent covers are strong enough to be used on the floor or they can be wall or ceiling mounted. Each Craftsman register is made with a 1/4" thick faceplate and a steel damper to regulate air through your home. The solid bronze vent covers are sand cast in the United States and are made to order items. All of the Craftsman registers are assembled by hand, ensuring that you will get a dependable product. The bronze vent covers are available in your choice of hand rubbed dark, antique or light bronze patinas. Our Craftsman registers will blend in with any home decor to give your room comfort and warmth that traditional registers lack. 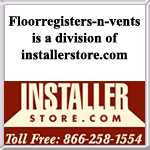 All of the bronze vent covers come with screw holes and installation screws unless otherwise noted during checkout. Make sure your Craftsman registers are all ordered at the same time to ensure that the patinas will closely match each other. Tip: These bronze vent covers are listed according to the size of your hole opening in the wall. The 14 x 14 Craftsman register will fit into a duct opening of that size. The outer faceplate will have an additional 2 inches added to it for installation ease. Please note sizes may vary due to being handmade. Important: Bronze vent covers are considered a special, non returnable item and cannot be canceled once payment has been received. The Craftsman registers are made upon order and will ship after 7 to 9 weeks of the order being placed. 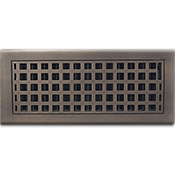 Find other bronze vent covers in the Classic Grilles wall register section of our website. These Craftsman registers are also available for purchase as a return air vent cover with a screen backing. Order these Craftsman bronze vent covers all together and save with our low cost shipping!